>Simply microwave these MediBeads™ heat packs for one to two minutes for heat that lasts up to 30 minutes. The heat packs are filled with non-toxic beads made from natural materials. Moisture-creating beads provide deep, moist heat therapy without water. After treatment, the beads rejuvenate themselves by recovering moisture from the air. 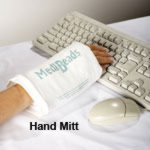 MediBeads™ are reusable, washable, odor-free, dust free and will not support bacteria or fungal growth. Hot packs provide fast relief for aching muscles, painful joints, headaches and arthritis pain. These heat wraps are very durable and will last for years. Standard (9" x 12") - Use while sitting or lying. Designed for shoulders, back and abdomen. King (12" x 16") - Treats large areas such as legs, hips, back or abdomen. 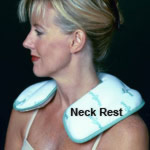 Neck Rest (10 1/2" x 14") - Relieves tight, sore muscles in neck and shoulders. 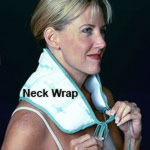 Neck Wrap (8" x 22" pad with ties) - Drapes around the neck and ties to reach lower shoulder muscles. 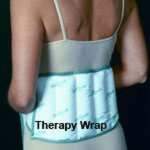 Therapy Wrap (7" x 14" pad with ties) - Ties around the back, abdomen, hips or shoulders for freedom of movement. Fits waist up to 60 inches.